Often tossed up with the obligatory broccoli and carrot medley, cauliflower is coming into its own! It can be boiled, steamed, roasted, pickled or eaten raw! Although tasty topped with a cheese sauce, there are lots of healthy and amazingly d’lish ways to cook up a head of cauliflower. Oven-roasting gives cauliflower a nice sweetness and a little bit of a nutty flavor. Perfect when paired with cherry tomatoes and salty Kalamata olives. A great new trend that I’m seeing are “Cauliflower Steaks” – yep, you heard right! Cut a couple inch-thick slices across the middle of the head and grill until tender. You can cut up the rest of the florets, cook in milk with spices like red curry, ginger and garlic, then process in a blender to make a tasty puree to serve with your “cauliflower steaks!” Try my recipe for Grilled Cauliflower Steaks with Red Curry Puree, its healthy and delicious … and very low calorie! I know the cheddar and cauliflower combo is hard to beat… so for those that like to splurge I also whipped up a recipe for a Cauliflower Cheddar Custard – I cook the cauliflower in milk, then mix with egg and cheese and bake in small custard dishes. Serve this rich and delicious savory custard next to a delicious steak or a lovely crisp green salad. And look for tiny baby heads of cauliflower at your farmers market this summer – very tasty to roast or grill whole. Cut 3 large 1-inch steaks out of the center of the cauliflower. Cut each one in half. Set aside. Cut remaining cauliflower into florets to produce about 3 cups. In a medium saucepan, heat the 1/2 tsp olive oil over medium heat. Add the garlic and ginger and sauté until just tender but not browned. Stir in the curry paste and then add the milk, salt, lime juice, and the 3 cups of florets. Increase heat to medium high, cover tightly and simmer cauliflower until cooked tender – about 10–12 minutes. Remove from heat and carefully transfer the cauliflower and liquid to a blender or food processor. Cover the lid with a towel and process until smooth. Taste for seasoning and keep warm. Meanwhile heat a grill pan over medium-high heat. Brush cauliflower steaks lightly with olive oil. Place cauliflower steaks in pre-heated pan, season with salt and pepper and cook on each side until nicely grill marked (about 5 min on each side) and then move pan to the oven and continue cooking steaks until just tender (about 7-10 minutes). Or you can cook the cauliflower on an outdoor grill all the way, with the lid down to assist with cooking. To serve, spoon some of the cauliflower puree on plates. 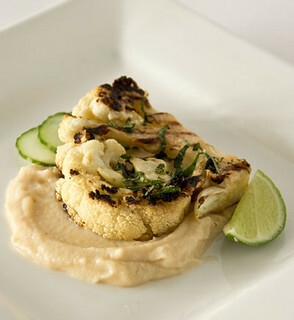 Top with grilled cauliflower, and garnish with chopped herbs, lime wedges for squeezing and cucumber if desired. This makes an excellent light supper served with a salad, or an accompaniment to a big juicy grilled steak. In a small cup or bowl, mix the cornstarch and sherry until smooth. Whisk this slurry into the hot mixture and let cook for about 1 minute or until thickened. Remove from heat. In a large bowl, whisk together the eggs until well combined, and then stir in 1/3 of the hot cauliflower mixture. Then add the remaining hot cauliflower mixture and stir well to combine. Fold in the cheese. Divide mixture between 4 well-buttered 6-ounce custard cups. (Use a ladle to do this and be sure to stir up mixture well when portioning.) Set custard cups on a rimmed baking pan and bake for about 20 minutes or until the tops are golden and a wooden toothpick inserted in the centers comes out just barely clean. The centers should still be just slightly wiggly as the custards will continue cooking for a bit after they come out of the oven. Serve in the baking cups, or let cool for a couple of minutes, then run a knife around the edges and turn out into plates to serve. Potato Chip Day is this week and there is nothing that can satisfy a salty, crunchy craving like good old potato chips! They’re great on their own, but also great with dips such as retro French onion, clam or ranch. Tim’s is our local beloved brand, which is of course so good washed down with a local brew. But have you had them in a cookie yet is the real question!? One of my favorite sweet and salty potato chip ideas is to add them to cookies. That’s right, I said cookies! Just crunch them up and fold into your favorite chocolate chip cookie recipe. 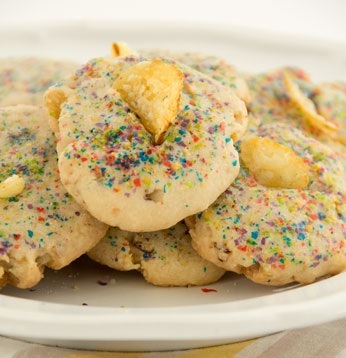 Or add them to a shortbread cookie such as Nutty Potato Chip Sparkle Shortbread. Yum! And if you are a die-hard potato chip fan, there are so many varieties to try. In my travels, I have seen and tasted lots! In New Orleans, I had Spicy Cajun Crawtator Potato Chips and overseas, I had Fried Chicken flavored in the Philippines! To make the topping: combine the sugar, edible glitter and salt together in a small bowl and set aside. To make the cookies: place the butter and sugar into a mixing bowl, and cream together for about 2 minutes. Once combined, add vanilla and almond extracts and mix until incorporated. Add the flour, and mix until fully incorporated. Scrape down bowl to mix in any ingredients on the bottom of bowl. Add pecans and potato chips and slowly mix together until just combined. Line a baking sheet tray with parchment paper. Divide dough into about 22 pieces – scooping up heaping Tablespoons. Roll into balls and then dip/press the top of each ball into the Cookie Topping. Place the dipped balls, glitter side up onto pan, leaving at least 2-inches between cookies. Using a flat bottom glass press each ball to about 1/4-inch thick – cookies should press out to about 2-inches wide. Poke a small piece of potato chip into the top of each cookie for garnish. Bake in pre-heated oven for about 18-20 minutes. Cool directly on tray. Recipe by Kathy Casey Food Studios. Great friend, award winning writer, and long time Pacific Northwest native Cynthia Nims has written a wonderful series of e-cookbooks covering The Northwest! Whether you’re looking to cook up up Crabs and Wild Mushrooms or looking for a new combo of Soups, Salads, & Sandwiches, Cynthia has you covered and more! The ebooks are priced at $3.50 each (what a steal!) and are available to download through the Kindle and most mobile/tablet devices with the free Kindle app. Looking to make a meal to impress, but don’t want to break the bank? 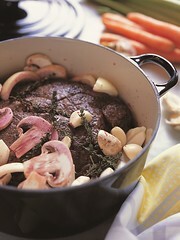 Braising can make even the toughest meats a melt-in-your-mouth experience. Braising is a loooooonnnng, slow cooking method that can be done on the stove top, in the oven, or in a crock pot! What a great treatment for less tender, more flavorful cuts of meat, such as beef chuck, lamb shanks, chicken legs, or short ribs. Generally, these cuts are less expensive, but really taste like a million bucks if they’re cooked low and slow. First, season up your meat then give it a good sear in a hot pan with a touch of oil. Then add tasty ingredients like wine, herbs and veggies. Cover tightly and pop the pan in a low oven (around 300 – 325 degrees) and forget about it for a few hours! The hardest part: be patient! Don’t try to rush the process. This will take time and your patience (and taste buds) will be greatly rewarded. And of course, don’t forget about all that juicy braising liquid. It’s perfect to use in a tasty sauce. If the sauce is not thick enough, make a cornstarch slurry using 1 tablespoon cornstarch mixed with 2 tablespoons water. Whisk the slurry into the simmering sauce, a little at a time, until the desired thickness is reached.